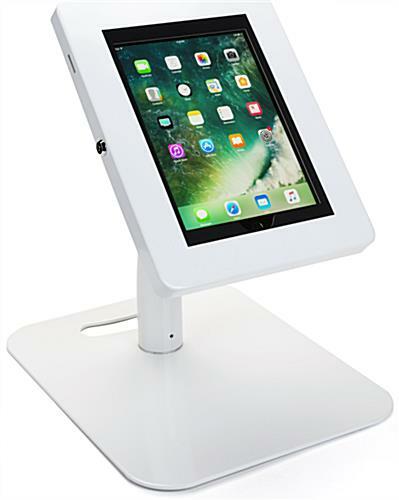 With a modern white finish, this floor to counter tamper-proof tablet holder makes for a pleasing fixture in any establishment. 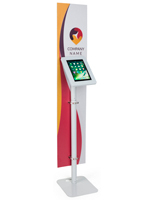 A lockable enclosure with included set of keys makes this security display perfect for use in retail stores or heavily trafficked environments. 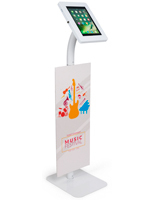 The white tamper-proof tablet holder also rotates for easy use as a retail kiosk, information stand, or public sign-up station. Foam padding protects your electronics and provides additional support for multiple iPad generations and Android devices. 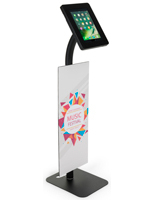 Each security display is constructed of steel and aluminum for durability and peace of mind when leaving your tablet holder out in public. 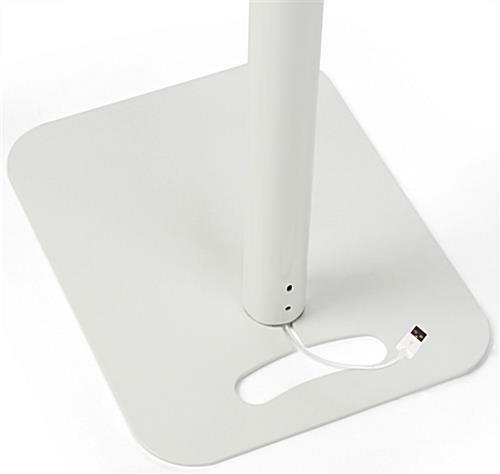 Transform your full height stand to a countertop unit by simply removing the large pole from the base and curved sections. 12.0" x 48.5" x 15.0"
9.5" x 12.1" x 1.0"
iPad 2nd Gen., iPad 3rd Gen., iPad 4th Gen., iPad Air, iPad Air 2, iPad Pro 10.5", iPad Pro 9.7", iPad 2017 (5th Gen.), iPad 2018 (6th Gen.), Galaxy Tab A 9.7", Galaxy Tab A 10.1", Galaxy Tab S2/S3 9.7", Galaxy Tab 3/4 10.1"
Stand came and looks great, I like that I can change it from floor stand to table top. Love the additional anti theft features (how the screws are counter sunk). Excited to use this at an upcoming show. This item arrived exactly as described and works great! The assembly was easy and did not take long to put together. The only downside was not having a charging component built-in (for the charging cord to run through). Erin, thank you so much for your great review! 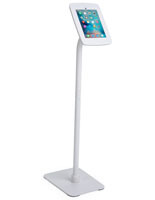 We're so happy to hear that this tablet stand is working great for your needs and was easy to put together. 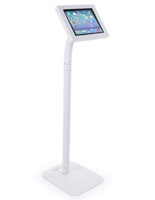 While this unit does not have a charging component built-in, the stand's pole is hollow to allow you to run a charging cord through the base and up to the enclosure. We hope that helps! Stands are exactly what they say they are in the description. I had to play around with the cushions in the cases until I found the one that I liked best for our iPads, but it wasn't a big deal. They are relatively easy to put together (I did three all by myself), but you need to read the directions closely. I purchased three; one came damaged. I called customer service, and they offered me, without debate, a refund or a discount. Since the item was for my church, I asked for a replacement, and they agreed without hesitation and completed my order through the live chat service. I received a follow up email, and to my surprise, I received my replacement IN LESS THAN 24 HOURS! I am more than pleased with the customer service I received, and the items are exactly what I thought I would get. I will definitely use this company again in the future. Thank you so much for the wonderful review, Jennifer! 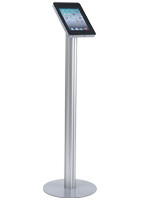 We're so happy that our iPad stands are perfect for your church, and we applaud you for putting these together all by yourself! We're glad that the assembly process was easy, and that our customer service team took excellent care of you to quickly replace the damaged item. We appreciate your business, and we hope you'll shop with us again soon! Wow! Great customer service! Stand arrived quickly and was easy to put together. Thanks for the awesome review, Michele! Very easy to put together, easy to take apart. I like the durability and the cost is good for what you get. 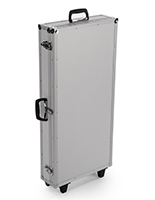 It would be nice to have a case with this, I don't know how else to ship this except use the box it comes in. 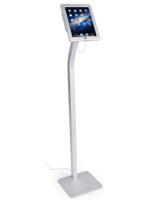 Hi Damaris, We're glad the iPad stand is working well for you! We're going to look into a shipping case that would work. We'll update you as soon as we have one. Thanks for your patience! Hello again, Damaris. 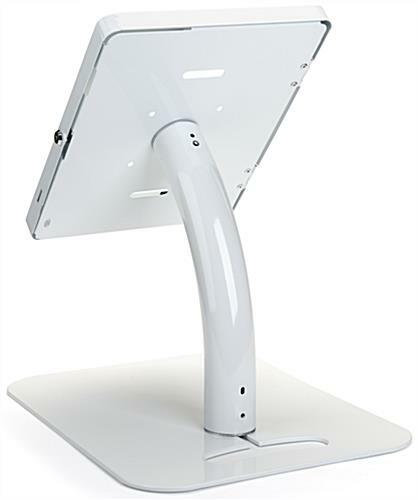 Unfortunately at this time, we do carry a case that would work well with this stand, but due to feedback from awesome customers like you one may be in the works very soon! We will update here upon that coming to fruition.